(an'tē-bod'ē), Avoid the jargonistic use of the plural antibodies when the reference is to a single antibody species. An immunoglobulin molecule produced by B-lymphoid cells that combine specifically with an immunogen or antigen. Antibodies may be present naturally, their specificity is determined through gene rearrangement or somatic replacement or may be synthesized in response to stimulus provided by the introduction of an antigen; antibodies are found in the blood and body fluids, although the basic structure of the molecule consists of two light and two heavy chains, antibodies may also be found as dimers, trimers, or pentamers. After binding antigen, some antibodies may fix, complement, bind to surface receptors on immune cells, and in some cases may neutralize microorganisms. /an·ti·body/ (Ab) (an´tĭ-bod-e) an immunoglobulin molecule that reacts with a specific antigen that induced its synthesis and with similar molecules; classified according to mode of action as agglutinin, bacteriolysin, hemolysin, opsonin, or precipitin. Antibodies are synthesized by B lymphocytes that have been activated by the binding of an antigen to a cell-surface receptor. See immunoglobulin. anaphylactic antibody IgE antibody causing anaphylaxis. antimitochondrial antibodies circulating antibodies directed against inner mitochondrial antigens seen in almost all patients with primary biliary cirrhosis. antinuclear antibodies (ANA) autoantibodies directed against components of the cell nucleus, e.g., DNA, RNA, and histones. antireceptor antibodies autoantibodies against cell-surface receptors, e.g., those directed against β2-adrenergic receptors in some patients with allergic disorders. antisperm antibody (ASA) any of various surface-bound antibodies found on sperm after infection, trauma to the testes, or vasectomy; they interfere with the fertilization process or result in nonviable zygotes. antithyroglobulin antibodies those directed against thyroglobulin, demonstrable in about one-third of patients with thyroiditis, Graves' disease, and thyroid carcinoma. 1. one (usually IgG) that reacts preferentially with an antigen, preventing it from reacting with a cytotropic antibody (IgE), and producing a hypersensitivity reaction. complement-fixing antibody one that activates complement when reacted with antigen: IgM and IgG fix complement by the classical pathway; IgA, by the alternative pathway. complete antibody one that reacts with the antigen in saline, producing an agglutination or precipitation reaction. cytotoxic antibody any specific antibody directed against cellular antigens that, when bound to the antigen, activates the complement pathway or activates killer cells, resulting in cell lysis. cytotropic antibody any of a class of antibodies that attach to tissue cells through their Fc segments to induce the release of histamine and other vasoconstrictive amines important in immediate hypersensitivity reactions. Donath-Landsteiner antibody an IgG antibody directed against the P blood group antigen; it binds to red cells at low temperatures and induces complement-mediated lysis on warming, and is responsible for hemolysis in paroxysmal cold hemoglobinuria. Forssman antibody heterophile antibody directed against the Forssman antigen. heteroclitic antibody antibody produced in response to immunization with one antigen but having a higher affinity for a second antigen that was not present during immunization. heterogenetic antibody , heterophil antibody, heterophile antibody antibody directed against heterophile antigens. Heterophile sheep erythrocyte agglutinins appear in the serum of patients with infectious mononucleosis. immune antibody one induced by immunization or by transfusion incompatibility, in contrast to natural antibodies. 1. antibody that binds to erythrocytes or bacteria but does not produce agglutination. 2. a univalent antibody fragment, e.g., Fab fragment. indium-111 antimyosin antibody a monoclonal antibody against myosin, labeled with indium 111; it binds selectively to irreversibly damaged myocytes and is used in infarct avid scintigraphy. monoclonal antibodies chemically and immunologically homogeneous antibodies produced by hybridomas, used as laboratory reagents in radioimmunoassays, ELISA, and immunofluorescence assays. natural antibodies ones that react with antigens to which the individual has had no known exposure. neutralizing antibody one which, on mixture with the homologous infectious agent, reduces the infectious titer. OKT3 monoclonal antibody a mouse monoclonal antibody directed against T3 lymphocytes and used to prevent or treat organ rejection after transplantation. 1. the preexisting antibody against HLA antigens in the serum of a potential allograft recipient that reacts with a specific antigen in a panel of leukocytes, with a higher percentage indicating a higher risk of a positive crossmatch. 2. the percentage of such antibody in the recipient's blood. P-K antibodies , Prausnitz-Küstner antibodies cytotropic antibodies of the immunoglobulin class IgE, responsible for cutaneous anaphylaxis. protective antibody one responsible for immunity to an infectious agent observed in passive immunity. A Y-shaped protein on the surface of B cells that is secreted into the blood or lymph in response to an antigenic stimulus, such as a bacterium, virus, parasite, or transplanted organ, and that neutralizes the antigen by binding specifically to it; an immunoglobulin. an immunoglobulin produced by B-lymphocytes in response to bacteria, viruses, or other antigenic substances. An antibody is specific to an antigen. Each class of antibody is named for its action. Antibodies include agglutinins, bacteriolysins, opsonins, and precipitins. See also antiantibody, B cell, immune response. An immunoglobulin produced by plasma cells, which has a specific amino acid sequence and specifically binds to the antigen(s) (e.g., foreign proteins, microbes or toxins) that induced its synthesis; antibodies may also bind to closely related antigens. Immunology An immunoglobulin produced by plasma cells, which has a specific amino acid sequence and specifically binds to the antigen(s)–eg, foreign proteins, microbes or toxins, that induced its synthesis; antibodies may bind to closely related antigens. See Acetylcholine receptor antibody, Anticardiolipin antibody, Anticentromere antibody, Anti-double-stranded DNA antibody, Anti-epidermal antibody, Anti-extractable nuclear antibody, Antigliadin antibody, Antihistone antibody, Anti-idiotype antibody, Anti-insulin antibody, Anti-islet cell antibody, Anti-Jo-1 antibody, Anti-LANA antibody, Antimicrosomal antibody, Antimitochondrial antibody, Antimyelin antibody, Antimyeloperoxidase antibody, Antineuronal-nuclear antibody, Antineutrophil cytoplasmic antibody, Antinuclear antibody, Antiparietal cell antibody, Anti-platelet antibody, Anti-PRP antibody, Anti-Purkinje cell antibody, Anti-receptor antibody, Anti-reticulin antibody, Anti-ribosomal antibody, Anti-Ro/SSA antibody, Anti-single-stranded DNA antibody, Anti-striated muscle antibody, Anti-thyroglobulin antibody, Antithyroid antibody, Antithyroid peroxidase antibody, Anti-tumor necrosis factor- α monoclonal antibody, Autoantibody, Bexxar radiolabeled monoclonal antibody, Secondary antibody, Binding antibody, Blocking antibody, Catabolic antibody, Catalytic antibody, Chimeric antibody, Core antibody, Cross-reactive antibody, Designer antibody, Enhancing antibody, Fluorescent treponemal antibody, Functional antibody, GAD antibody, Glutamic acid decarboxylase autoantibody, HAMA antibody, Heterophile antibody, HIV antibody, HTLA antibody, Humanized antibody, Immunoglobulin, Insulin receptor antibody, Intrinsic factor antibody, Islet antibody, Isotypic control antibody, Ku antibody, LW antibody, Miniantibody, MOC-31 antibody, Monoclonal antibody, Neutralizing antibody, Parietal cell antibody, Plantibody antibody, PM-1 antibody, Polyclonal antibody, Primary antibody, Purkinje cell antibody, RANA antibody, Scleroderma antibody, Sjögren antibody, Sm antibody, Smooth muscle antibody, Sperm antibody, Thyroid stimulating hormone receptor antibody, Trichinosis antibody, Warm antibody. An immunoglobulin molecule with a specific amino acid sequence evoked in humans or other animals by an antigen and characterized by reacting specifically with the antigen in some demonstrable way, produced by B lymphocytes in response to an antigen. It is believed that antibodies also may exist naturally, without being present as a result of the stimulus provided by the introduction of an antigen. A Y-shaped protein molecule, called an IMMUNOGLOBULIN, produced by the B group of lymphocytes in response to the presence of a ANTIGEN. An appropriate B lymphocyte is selected from the existing repertoire. This then produces a clone of PLASMA CELLS each capable of synthesizing large numbers of specific antibodies to combat the infection. The B cells also produce memory cells. 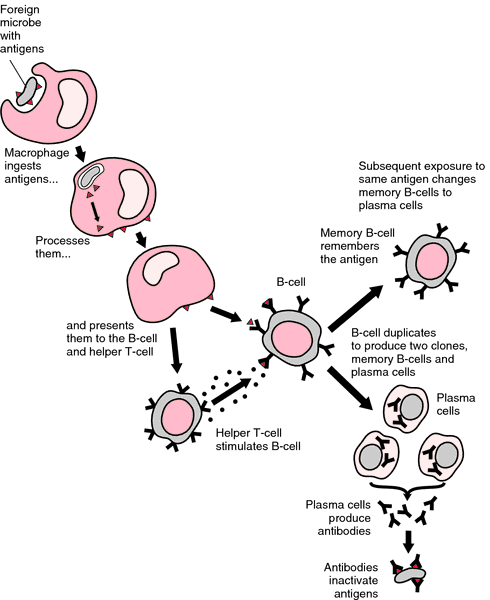 Subsequent infection with the same antigen prompts the memory cells to clone plasma cells and produce the correct antibodies without further delay. This is an important way in which an infection leads to subsequent immunity. Antibodies are able to neutralize antigens or render them susceptible to destruction by PHAGOCYTES in the body. 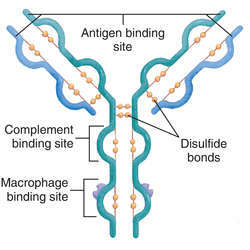 The basic structure of an antibody consists of four polypeptide chains linked by disulphide bridges, two larger structures called HEAVY CHAINS and two smaller called LIGHT CHAINS. a type of protein called an IMMUNOGLOBULIN that reacts with a specific ANTIGEN, and serves as part of a vital body-defence mechanism. Various reactions can occur between antigen and antibody. If the antigen is a TOXIN (as in snake venom, or as produced by bacteria causing, for example, botulism and tetanus), neutralizing antibodies are called antitoxins. If the antigen is adhering to the surface of a cell, antibodies called agglutinins cause clumping or AGGLUTINATION of cells, while another antibody type (lysins) cause disintegration or LYSIS of the cell in conjunction with COMPLEMENT. Other antibodies (opsonins) facilitate uptake of antigens by PHAGOCYTES in the blood, while precipitins cause soluble antigens to precipitate. Antibodies are produced in the lymphoid tissues of the body, e.g. LYMPH NODES, by a type of LYMPHOCYTE called B-CELLS. Most antibodies are produced during exposure to an antigen, such a response being termed active immunity. Specific antibodies to rare or synthetic antigens can be manufactured as easily as those to common antigens. A few antibodies are produced even without the apparent presence of the appropriate antigen. Such ‘natural’ antibodies include several involved in blood grouping, e.g. A and B antibodies in the ABO BLOOD GROUP. Young mammals have limited capacity to produce antibodies in the first few weeks of life, but can obtain some passive immunity by receiving maternal antibodies via the mother's milk. This fact has been used to encourage human mothers to breast-feed their infants rather than bottle-feed. Most antibodies circulate in the blood and other body fluids, but most if not all body secretions also contain antibodies, mainly of the IgA type; See IMMUNOGLOBULIN. A protein manufactured by a type of white blood cells called lymphocytes, in response to the presence of an antigen, or foreign protein, in the body. Because bacteria, viruses, and other organisms commonly contain many antigens, antibodies are formed against these foreign proteins to neutralize or destroy the invaders. n any of a wide assortment of glycoproteins typically present in the bloodstream that attack antigens during an immune response. Any of a large variety of proteins normally present in the body or produced in response to an antigen, which it is capable of combining with and destroying, thus producing an immune reaction. Antibodies are produced by a type of white blood cell called B cell (B lymphocyte) secreted by lymphatic tissue (e.g. bone marrow, lymph nodes) usually in response to an antigen. Some eye diseases are antibody-dependent (e.g. allergic conjunctivitis, atopic keratoconjunctivitis, vernal conjunctivitis). (Ab) (an'ti-bod-ē) Avoid the jargonistic use of the plural antibodies when the reference is to a single antibody species. An immunoglobulin molecule produced by B-lymphoid cells that combine specifically with an immunogen or antigen. Antibodies may be present naturally; their specificity is determined through gene rearrangement or somatic replacement or may be synthesized in response to stimulus provided by the introduction of an antigen. n 1. a specific substance that is produced by an animal as a reaction to the presence of an antigen and that reacts specifically with an antigen in some observable way. n 2. an immunoglobulin (preferred term), essential to the immune system, produced by lymphoid tissue in response to bacteria, viruses, or other antigenic substances. Each type is identified by its action, agglutinins, bacteriolysins, opsonins, and precipitins. See also immunoglobulins. n an antibody having an affinity for the cell nuclei. n the response of the lymphatic system to the presence of foreign substances in the body such as bacteria, viruses, food substances, pollens, and other antigens. n an antibody produced by a clone or genetically homogeneous population of hybrid cells. n the lymphatic system produces antibodies specific to each antigen. Viruses have the capacity to alter an antigen's genetic makeup, thereby creating a mutant antigen that requires new antibodies to combat it. A. Cardiolipin is a protein that is very common in the body. Mostly on heart and skeletal muscles. During several illnesses, mostly autoimmune, our body creates an antibody against it that do great damage and needs to cbe controlled.